I couldn't resist starting another new project. I have loved this one since it was released. 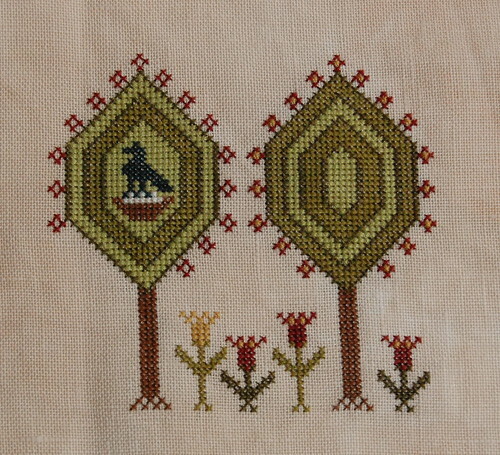 It's "Bird in the Bower" by Plum Street Samplers. This design is like chocolate for me. I don't want it to end! I love everything about it! Well, going to get back to stitching and listening to my new favorite series of books - The Sookie Stackhouse series by Charlaine Harris. They are so good! I wasn't so sure about them after I read the first one, but I decided to give the next one a try and the next one and now I'm hooked! Write soon! mmmm, love the colors of Bird in the Bower! Yummy! 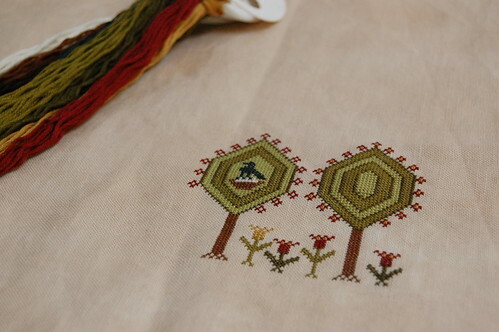 NPI are my favorite silks also and it has to be on 40 count linen - there's nothing better to stitch with! I love this one too, have it - hope to stitch it - like someday! It's already gorgeous Nicole! I love this design and the fabric and threads you are using are just scrumptious! Great start, Nicole! I really love this design, too. I can always be sure YOU will enable me to stitch things I'd never really thought about!!! Lovely Birds in the Bower! Will check out your reading recommendation and look forward to the next installment of your stitching! Sookie is my favorite not real person. I started reading that series 6 years ago or so and I look forward to each and every new release. Wow!!! The colors are stunning!!!!! Wonderful new start...just looks great! I'm off to add Bird in the Bower to my list of designs to purchase eventually. :) Have a good day!! Nicole, your new start is great. I like that pattern too. I've read the first Sookie Sackhouse book too, and have the next one at home on my shelf of books ready to read.... I always have at least 6 home from the library at any given time. I am addicted to Sookie books too. 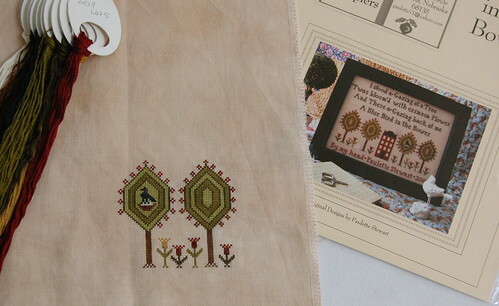 Great new start, I am thinking of starting the handworke sampler by plum street soon - love her designs. Huge fan of Sookie here too - enjoy!!! I love this design as well! It's looking so pretty. I wish I had every NPI color as well -- wouldn't that be wonderful? I'd actually be happy having a full set of anything. Even DMC! I love those trees. I'm going to have to do that one, too. oh what a great start!! !